Conrad von Hötzendorf, Chief of the Austro-Hungarian General Staff, Vienna, 1914. By the end of that year he had lost as many as one million men, much of his country's rolling stock, and the northeastern region of Galicia. His forces had also been defeated by Serbia three times. The general staffs of the major powers made and elaborated on their war plans, with greater or lesser degrees of political involvement, coordinating plans with their allies or assuming coordination would be forthcoming when needed. Germany's war plan, its only plan, assumed the country would fight a two-front war against both France and its ally Russia. By achieving a quick German victory over France while Russia was slowly mobilizing its massive army, military planners aimed to turn a two-front war into two sequential single-front wars. The focus of the German plan developed at the turn of the century by General Alfred von Schlieffen, Chief of the German General Staff, was the rapid defeat of France. Von Schlieffen was correct in his assumption about the French plan, that France would attack Germany in Alsace and Lorraine, the provinces France lost to Germany in the Franco-Prussian war of 1870-71. Here, on its left wing, Germany would fight a defensive war, giving ground if necessary to keep the right wing, the offensive, strong. On the offensive, German forces would pivot at Luxembourg, at the northern end of the Franco/German border. Schlieffen's plan called for the transit of German forces through Luxembourg, Belgium, and the Netherlands, with the outer edge of the assault, the right wing, moving rapidly across the countries as far west as the North Sea and Channel coast before turning south and continuing into France, and then east, enveloping Paris and the bulk of the French army coming to the city's defense. Von Schlieffen continued developing and modifying his plan, as did General Helmuth von Moltke, who succeeded him in 1906. The war against France was to be over in ??? weeks??? [HOW MANY?] at which time Germany would transport troops by rail to face, and defeat, a Russia that had finally mobilized. Under the plan, von Schlieffen was willing to accept temporary losses of German territory both in Alsace-Lorraine and in east Prussia, secure in the knowledge that both would be regained with German victories against both invaders. 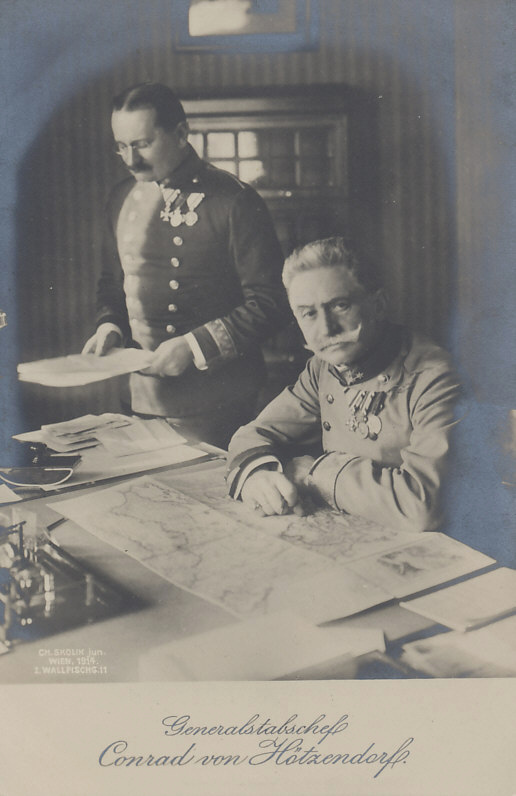 Within the German military, there was some skepticism of the Schlieffen Plan [Herwig]. It ignored the effect of any British land forces opposing the German advance, it overestimated the capabilities of the reserve forces that significantly enhanced the size of the German forces, and it was vague about the siege and seizure of Paris, which would require 7 or 8 army corps. Some doubted that a war between major European powers would be a short one. The plan also required the invasion of three neutral countries. When war did come, the high command could not tolerate the loss of national territory, even if it was assumed to be temporary. Moltke modified Schlieffen's plan to avoid an invasion of the Netherlands, in hopes it would remain neutral and available as a trading partner with access to the North Sea and international trade. Avoiding violating the neutrality of the Netherlands narrowed the route of the German forces that would strike France along its northern border. Germany positioned seven armies along the along its western border, from the First Army in the north sequentially to the Seventh north of the Swiss border. The First Army faced the Netherlands, and would need to move south to advance into Belgium. It was the outermost army of von Schlieffen's arc, with the most ground to cover and required to move most quickly. The German Eighth Army was in the salient of East Prussia, facing Russia and Polish Russia to the east and south. Other than the Schlieffen plan, as modified by von Moltke, there was no other German plan. It assumed that Belgium would not offer resistance that would delay or otherwise affect the execution of the plan. ??? Neutral Belgium had gained its independence from the Kingdom of the Netherlands in the 1830 [Putnam’s Historical Atlas, p. 71] Revolution [Baedeker, page xxiii]. The 1831 treaty that established Belgian independence and neutrality was reaffirmed by the 1839 and 1867 Treaties of London. The signatories (including Austria, Great Britain, France, Russia, and predecessors to the German Empire: the German Confederation (1839) and the Kingdom of Prussia (1867)) guaranteed Belgian independence and neutrality. Belgium guarded its neutrality so zealously that it made no advance plans with a potential ally in the event of an invasion. The Belgian Army, which was being reorganized in 1914, was solely for the defense of the country. The reorganization was not scheduled for completion until 1917. Besides its army, Belgium was defended by forts and fortresses including those at Dinant and Namur and the fortress cities of Liège and Antwerp. On the Meuse River, Liège lay in the narrow passage between the Netherlands and Luxembourg, close to the German border to the east, and encircled by twelve forts. Namur and Dinant, west of Liège, were also on the Meuse, Namur where it joined the Sambre River and flowed south towards France, and Dinant a short distance from the French border. The 1839 and 1867 Treaties also guaranteed Luxembourg's neutrality. France's primary plan in 1914 was Plan XVII, under which France would invade her "lost territories," of Alsace and Lorraine, now German territory, and the only part of the German Empire bordering France. French military planners valued the attack, and believed their vigorous offense would overcome their opponents defense. The French and colonial soldiers would advance on foot, building to a run, rifle at the ready, and bayonet mounted. 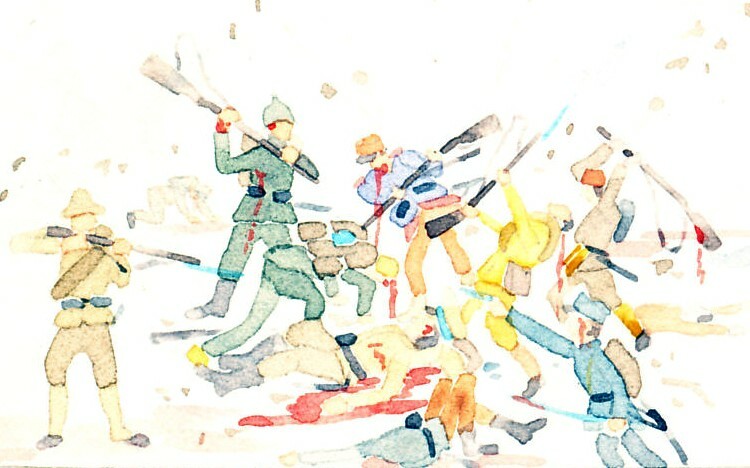 When this mass of troops reached their objected, and collided with another, the bayonet would be put to use, and, in hand-to-hand combat, the French would prevail. The French Army consisted of five Armies. The First, Second, and Third faced Germany to the east and were positioned between the fortress cities of Belfort, Epinal, Nancy, and Verdun. The Fifth Army was on the Belgian border at Sedan, site of France's defeat in 1871. The Fourth Army was held in reserve southwest of Verdun. If Germany were to invade Belgium, the Fifth Army was to move north into Belgium, and the Fourth Army to fall into position between the Third and Fifth Armies. The French Army was significantly smaller ??? than the German Army. It assumed and was dependent on timely action by its ally Russia to draw German forces from an attack on France to the Russian front. The French and British military had also made plans in the event of a war against Germany. Russian war plans were based on an assumption of simultaneous war against both Germany and Austria-Hungary, requiring mobilizing forces from the Baltic Sea to the Romanian border, facing both empires. Russian railways had been extended in Russian Poland, and could move more quickly, to the north or west against Germany, or south against Austria-Hungary. Russia had several versions of its plans. Variant G was to be executed if Germany struck Russia from East Prussia, in which case Russia would deploy the greater part of its forces against Germany. Variant A was focused on Austria-Hungary. It called for two armies totaling 29 divisions facing Germany, four armies totaling 45 divisions deployed to invade Austria-Hungary, and two reserve armies. On July 30, 1914, Russia executed Variant A with over 1,300,000 men mobilized. The Russian First and Second Armies were stationed east of Prussia facing Germany. The Fifth, Third, and Eight Armies faced Austria-Hungary. Under Variant A, the Fourth Army would be take its position in Polish Russia on the Russian right wing facing Austria-Hungary. Under Variant G and against a German attack, it would take its place north of the First and Second Armies, defending the Baltic provinces, and thwarting any German drive toward St. Petersburg. In Austria-Hungary, Franz Conrad von Hötzendorf , Commander-in-Chief??? of the Imperial and Royal Army had multiple plans, for two fronts and two or three opponents[? ]: against Russia, Serbia, and one of their allies, Romania? Italy? [Herwig? p. 53]. The Austro-Hungarian First, Third, and Fourth Armies were positioned in Galicia facing north into Polish Russia, between the border and the fortress cities of Lemberg and Przemyśl. The Fifth and Sixth Armies were stationed in Bosnia to the south facing Serbia's northwestern border. The Second Army could be positioned for action against Serbia (Plan A) or Russia (Plan R). Under Plan A, it would strike at Serbia's capital of Belgrade across the Danube River. It would support an offensive against Russia by moving to the right wing of the First, Fourth, and Third Armies in Galicia. Austria-Hungary prepared badly: It declared war on Serbia on July 28 even though its forces could not be mobilized until August 12, and despite evidence – diplomatic and other - that Russia would respond to the declaration by mobilizing. Conrad assumed German cooperation (as Germany did of Austria-Hungary), but did not coordinate his plans with Germany, which mobilized on July 31. Conrad sent troops to Serbia, then ???? responding to Russia's mobilization and Germany's request for support, routed them in the opposite direction to Russia. He expected to have five times as many trains to shuttle them back and forth as he had available. It required forced marches of almost 20 miles a day from August 19 to 26 for his army to reach Lemberg and the Russian border. Great Britain's army was not structured for a European land war, but the French and British military developed plans to counteract a German assault on France. As the world's greatest sea power, Britain would take responsibility for controlling the North Sea and Atlantic Ocean, and for protecting French ports on the Atlantic. The French fleet would withdraw to the Mediterranean, and protect not only French territory, but also England's vital sea routes through Gibralter and the Suez Canal. When war came, many British politicians would be surprised at the extent of the joint military plans. The French would be dismayed by the failure of Britain to execute them immediately. On August 3, 1914, while emphasizing that Britain had made no commitments to France or Russia, Foreign Secretary Grey told the House of Commons of the pre-war coordination of French and British navies, that the French Navy had already sailed for the Mediterranean, and that he had committed the Royal Navy to protect France's Atlantic coast from German attack. Tuchman, p. 140. The French and British staffs had also made plans for the landing of a British Expeditionary Force in France, and its positioning on the left wing of the French Army, thereby protecting the French if Germany should attack through Belgium. Mobilizing troops of the major powers, putting them on a war footing ???? ?, required complex schedules and operations: from the announcement, to the start of mobilization, the calling up of reserves, the cancelling of leaves for active service, the military command of the trains??? ?, collection points??? ?, predicated on train schedules. Put in motion, these machines of millions of men were hard to stop. Nor were they designed to: the plans of France, Germany, Russia, and Austria-Hungary put their forces on the offensive, not the defensive. General histories of the war or the beginning of the war will have information on Germany's Schlieffen Plan. Among the resources are some with more information on war plans of other nations and coordination of allied plans.